Thank you, dear readers, for your congratulatory comments! And thank you (WBS), for the bottles of champagne! We’re all celebrating the achievement of a goal! I couldn’t have done it without you, reading and commenting. I received 326 of your encouraging comments over last year! Thank you, thank you! I couldn’t resist doing some analysis. The most popular week was #11 (amber glass) with 11 comments; followed by week 17 (dark green) and week 38 (chrysoprase) with 9 comments; and week 25 (iridescent), with 8 comments. Then I checked he lower end: the peach necklace of week 15 got one comment, as did weeks 9 and 24 (brown and black with other colors). What was easy? Writing each blog flowed like a charm; not once did I experience writer’s block. Two things helped: lots of research so my head was full of interesting tidbits and I like to write. The other difficult challenge was to get rid of the blue background in most of my pictures. Not possible until I realized my kitchen window was UV-tinted, so I moved my photo area to a north-facing un-tinted window. I intended to rejuvenate my bead artistry as I turned 75. It turned out that meant I must create a spectacular necklace once a week for 52 weeks: that realization hit me early on; it became a point of pride and the true challenge. Twenty-nine necklaces sold. I am humbled and gratified. One existing collector (MBL) bought 5; a new collector (DS) also bought 5: to you both, a belated but heartfelt tip of the NYEve champagne glass! Another existing collector (SL) bought 2 and a long term friend (SG) bought 2! New friends, local friends, plus California friends took this year over the top for me! Thank you! More than one person has asked me to put this together in book form. That thought is a little overpowering right now. Over 52 weeks, my thoughts have delved more and more frequently into the ageing process. Having fun, making moments count, valuing relationships, letting the unimportant slip away, leaning into quality workmanship, keeping promises (to post every Wednesday come hell or high water! )—- this is what I learned this year. And how lucky I was that Rochelle Ford’s centerpiece and philosophy were the grand finale! One unintended consequence yielded a great benefit: I will donate four boxes of beads I no longer want after going through 52 drawers of beads acquired over 23-years, to Rosie’s Place, a non-profit in Boston, founded in 1974, which serves more than 12,000 poor and homeless women a year. 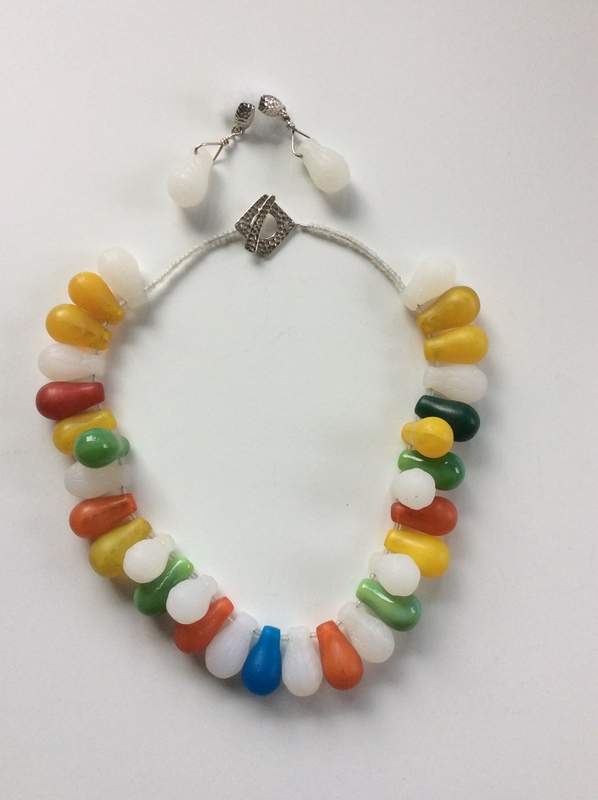 Their Craft Cooperative teaches women to make bead jewelry and learn a new skill. Thanks for hanging in there with me. I’m taking the rest of January off. I shall present a new program on February 1, 2018. Thank you all. See you soon. Be well. We have arrived at the last Wednesday of 2017 and at the bottom right last drawer. Drawer 52 actually contains faux amber, but the necklace would look a lot like Drawer 34 (August 23), so I have chosen to conclude my year’s work with panache. I will tie together an amazing centerpiece with a quote from the artist which will, in turn, tie together my thoughts on rejuvenating my work in my 75th year. I commissioned some recycled metal centerpieces from Rochelle and this is the last one in my inventory. Her piece is 5.75” by 4.75”. There are many crazy bits of metal welded together and painted. Like all my centerpieces, they dictate the colors of the beads: here olive and copper were the obvious choices. They had to be chunky, so there is lampwork glass, Indian glass, filigreed copper, a strand of small round flat vintage Czech glass, and it really demanded some hefty copper chain. It weighs just 10 oz, not a heavy necklace. 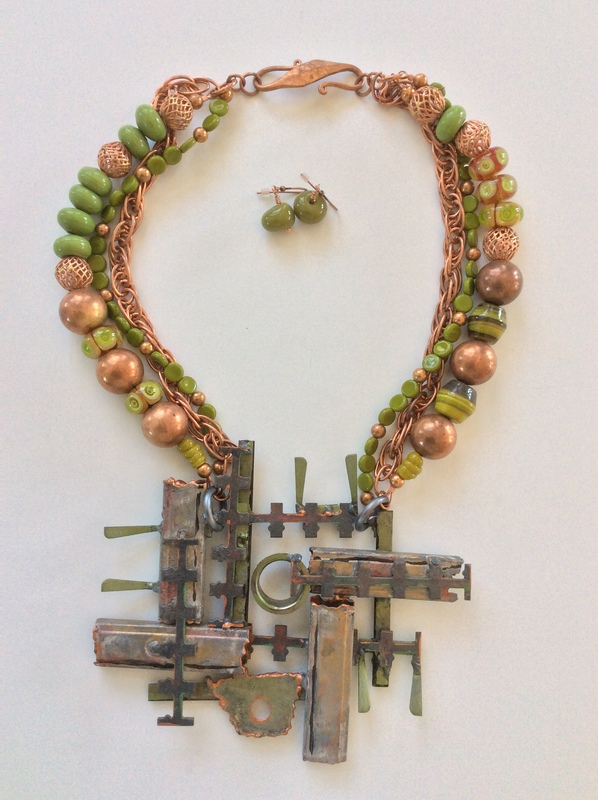 The beaded section is 9.5” long on each side and features a large copper clasp. Matching olive earrings don’t match with each other: one is round and the other an organic pear shape. As Rochelle recommends, have fun! $139. Rochelle’s story is too good not to tell, so I will do a week 53 wrap-up to tie together my thoughts on rejuvenating my work and what I learned over the past 52 weeks. We’ll pretend there are 53 weeks in 2017. You will love her website www.metalsculptor.com, or google her name Rochelle Ford. In the middle “double wide” drawer, I found two oddities: four glass beads painted on the inside that I found in a flea market-type setting in Beijing and my bag full of what I call bumpy beads, due to their surface texture, but undoubtedly vintage Bohemian pressed glass. As I emptied out the bumpy beads, the bright green ones wanted to be near the painted glass so they could pop the green in the landscape scenes. 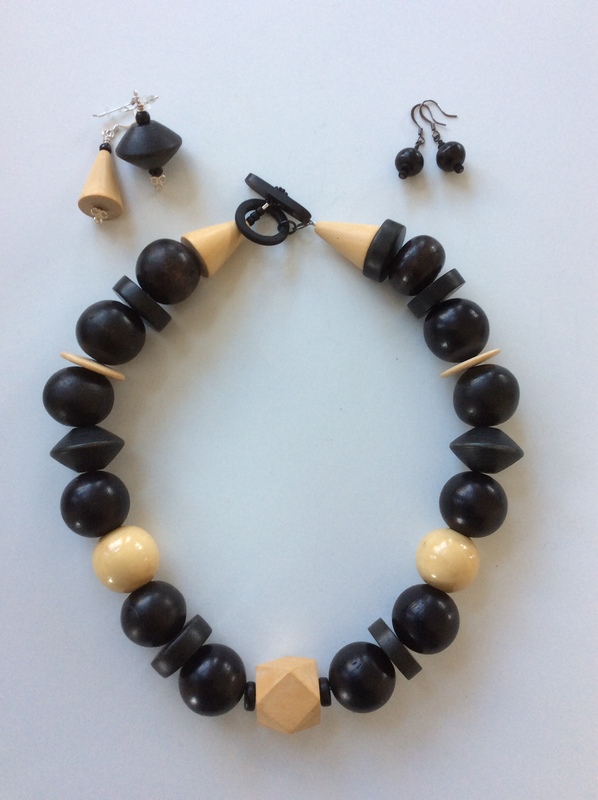 Finding some matte vintage Lucite beads that didn’t overpower the painted beads was easy—Drawer 6 offered a great selection. I chose three large plus a strand of medium faceted beads to intersperse with the green glass. Reverse painting originated in Venice in the 13th century, resurfaced as a method of portrait painting in the 19th century, and enchanted Americans as fancy lampshades in 1910. But it was the Chinese who elevated reverse painting to fine art using very delicate brushes. This necklace features two beads with a typical landscape of a lake, a boat, a mountain, and a verdant foreground with a tree by the lake. The other two feature an elegant crane in flight and, on the other side, a resting crane. Imagine packing all that inside a bead that is only ¾” in diameter! Cranes are a frequent symbol in the Chinese culture since they are a sign of longevity. A common expression is “heavenly crane” which is a reference to wisdom, the second role of the crane. I could not find any images of my bumpy bead collection, so my name sticks. I am confident they are the pressed glass Bohemian-style beads made in post-war Germany. See Drawer 30 for the story (7-26-17). This necklace is 22.5” long. The clasp is a matte glass odd-shaped circle with a silver toggle. I made earrings to match. Since I’ve had the painted beads for so long, I used their original low price and not the average price of $12 to $15 each I saw on Etsy. Therefore, the set is $79. Stay tuned…only one more Wednesday in 2017. I plan to end this challenge with panache!!! It is fitting that the Aventurine drawer is next to the Jade drawer because I used to have a lot of green aventurine which can be close to jade in color, and was my reason for making those drawers neighbors, but there are many other aventurine colors—blue, yellow, orange, and a brownish called red—which I have collected over the years and now outnumber the green. This necklace features red aventurine which I paired with a bug-eyed koi fish. At first, I chose white jade to fill in the Aventurine and it wasn’t working. A closer look at the fish showed me its underside was the palest of lavenders. I really had to suspend belief in color theory to go with Mother Nature’s combo of lavender and red aventurine. The results charmed me. Then my research told me why the colors worked: Aventurine is a form of quartz. The koi fish is agate which is one of the most common materials used in the art of hardstone carving and agate is also a quartz. If you are confused, it’s easier to say aventurine and agate have the same parents. Additionally, they both channel abundance in the world of crystal properties. The Chinese are very fond of Koi or goldfish and keep them in bowls in their homes or in ponds in the temple gardens. The Chinese words “jin yu” meaning goldfish are phonetically identical with the two words meaning “gold in abundance”, thereby making the goldfish/koi symbol a traditional wedding gift. The necklace measures 18” long plus 2.5” for the goldfish. I just found two more Red Aventurine beads and can make earrings to match. $69 plus $15 if earrings desired. Guess what else I discovered about quartz? It accounts for 12% of the Earth’s crust. I found my koi/goldfish cultural interpretations in the same book I referred to last week : A Dictionary of Chinese Symbols by Wolfram Eberhard, first published in 1983. To me, Jade is Hong Kong. Worn by many citizens, seen in shop windows, handled at the Jade Market: it is the heart and soul of Hong Kong. I became very attracted to it. When I discovered the Jade Market, I walked there from our Kowloon apartment, frequently slipping into the Yue Hwa Chinese Products Emporium, a large department store on Nathan Road, to find curios and objets for my growing Asian collectibles. Approaching the Jade Market were countless small jewelry shops full of Cantonese-speaking shoppers, men in the street hawking big chunks of jade from their small pick-up trucks, and a few Westerners like me with anticipation glistening in our eyes. The Market is really a tent, permanently erected, and certainly the size of a football field. I walked around until something I saw drew me in. The vendor rushed around with a low stool, a tray and a smile. I could sit for an hour, choosing the beads I deemed suitable for a necklace. Don and I lived in Hong Kong for 18 months in 1993-4 and the memory of the Jade Market is still fresh. Unfortunately, what material I have left from that era isn’t enough to make a necklace. So here is this week’s necklace: Suzhou jade, also called new jade, in a dark to light variation with two carved beads on each side separating the two shades. There were no leftover beads, so wear your silver earrings. A nicely carved turtle, 2” x 2.25”, is the centerpiece. Sterling silver clasp. The tortoise is an enigmatic creature for the Chinese, “concealing the secrets of heaven and earth”: they see its shell as the vaulted heaven and its underside as the flat disc of earth. It also symbolizes steadfastness. The necklace measures 18.5” long plus 2.25” for the tortoise. While still in Hong Kong, I started using my Jade Market finds. I found a helpful book to explain the meanings of carvings such as the tortoise above: A Dictionary of Chinese Symbols by Wolfram Eberhard, first published in 1983. For years I have bought “hill tribe” silver and only knew it was a recognizable style of workmanship made in Northern Thailand. Now I know so much I fear I shall bore you with my focus on the six tribes who make pieces like this fish centerpiece. Read on. Some names will be familiar to you. First of all, they work in a special silver which, at 97%, is in between sterling (92.5% silver content) and fine silver (100% silver). High silver content produces a softer metal which tarnishes less. Second, there are six tribes who, over the past 200 years, emigrated mostly from China and Tibet through thick forests and mountainous terrain to the “Golden Triangle” where Thailand, Laos and Myanmar meet. Third, the tribes retain their traditions in their clothing, their abundance of silver adornment, and their methods of making beads and jewelry. Their tools and processes are simple: silver ingots are flattened into sheets by pounding with a hammer. Then they pound the sheets into a mold and something like this fish emerges. They detail the piece—see fish scales—in their own signature style. The most populous tribe at 300,000 is the Karen, originally from Myanmar. They live in stilt houses with their animals beneath. They are expert elephant handlers (think logging and tourism); very friendly; and called the “long necks” due to the silver necklaces worn from collarbone to chin. Next largest are the Hmong, many of whom were welcomed as refugees in the USA after the Vietnamese war. They came from the icy regions of Tibet and Mongolia; settled in Chiang Mai, a large and lovely city; and are identified by their traditional clothing of pleated skirts and black baggy pants, both with lots of embroidery. Besides being silversmiths, they are dry rice farmers and may cultivate opium poppies. They are very independent, preferring to live above 3000 feet. The last tribe I’ll describe is the Mien (also called Yao) whose women are often photographed for their elaborate costumes and headpieces. They are considered the aristocrats of the region and have been making silver jewelry the longest. They are the only hill tribe with a written language and they use silver as their currency. They originate from Southern China, bringing their medieval religion, Taoism, with them, but many have converted to Christianity or Buddhism. The remaining three are called Akha, Lahu and Lisu. All proud silversmiths. The Drawer 46 necklace is full of trade beads, all with varying patina (read bumps and bruises from years of being traded), sterling silver and Naga shells (how I would love to tell you about the Naga tribe in the land-locked Himalayas who trade with shells and adorn themselves with shells, but no time for that story!) The fish centerpiece is a Karen Hill Tribe silver creation. The necklace is 20“ long and the fish is 2.5“long. Wear it with your silver earrings. $99. Trade beads are described in Drawers 12, 32 and 43. The first time I ever heard the words Lapis Lazuli (lapis is Roman for stone; lazuli is Persian for blue) was when I was matriculating at Emmanuel College, Boston, looking forward to becoming a junior and wearing our class ring which is gold with a rectangle of lapis as its centerpiece, designed by Tiffany in 1920. I was late to the lapis game. The inhabitants of NE Afghanistan knew it in the 7th millennium BC. It was Egyptian King Tut’s funeral mask in 1323 BC. The Western world didn’t catch on until lapis was imported to Europe in the Middle Ages where its powder was the choice of the great painters. I’ll refer to my favorite: Vermeer. Check out the “Girl with a Pearl Earring.” That blue paint is known as Ultramarine. The color is still on every painter’s palette, but the ingredients have been synthetic since the early 1800’s. Lapis is prized for its deep celestial blue color. It is a rock, not a crystal. It is found in Afghani caves, not mines. It sparkles with…gold?…no…with Fool’s Gold or pyrite. There is an inferior form of lapis with white calcite streaks which I learned to avoid. Just pay more for the gold flecks. This week’s necklace has flecks in every piece of the larger beads. The smaller beads, which I had to add to keep the weight down, is a brighter blue with few sparkles (and no white!). The sterling silver beads are a pleasing shape and further reduce the weight. 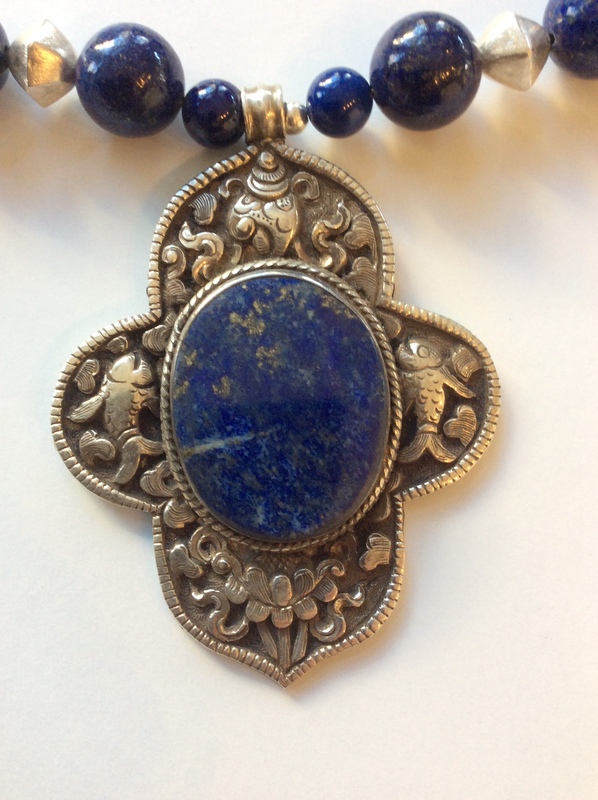 The centerpiece is magnificent for its large oval lapis, with lots of gold and a short streak of white, and for the Tibetan sterling silver base, carved with rich flourishes on the front and the back. While living in Hong Kong, I loved browsing the many English bookstores. It was still British until the 1997 handover to China who promised “one country, two systems,” referring to the financial, free-market and democratically-governed systems of Hong Kong. In my opinion, the promise is eroding. One of the books I treasure is “A Dictionary of Chinese Symbols” and I looked up the fish symbol which is prominently featured on the centerpiece. The well-carved pair of fish on the front are slightly worn, leading me to envision the wearer rubbing it as a talisman. Fish symbolize wealth which is so significant for Buddhists that it is one of their 8 symbols. I named this piece for the colloquial phrase for wishing others wealth. When fish appear in a pair, it signifies harmony, and is often given as a wedding gift. On the back of this piece is what I interpret to be a stylized fish. Pay attention to the design skill of the silversmith: beautiful flourishes, curves, almost rococo flair, expert three-dimensional detailing. The necklace measures 19.5” and the centerpiece is 3.5” long by 2.75” wide. It weighs 8.2 ounces. After test driving it, I would say it is not heavy/not light, but average. Some of my necklaces are “three-hour”, this is a five-hour necklace! Wear your silver earrings with it. $139. I remember buying this large Tibetan piece in the early 2000’s in New York City in a shop well-known for ethnic beads and objets. The price tag still stuck on the bottom said $150, but my note on the plastic bag said I paid $140…not my best negotiation! It was sold as an ear ornament from Gujarat. I accepted it as an ear ornament but when I looked up Gujarat, and learned it is in India, I doubted that was the true provenance. This was clearly Tibetan. I’ve been there twice and have made necklaces with many pieces of their inlaid silver or brass with turquoise or coral: I know their style. So, I conducted a lengthy internet search and, after scrolling many pages on www.indianamulets.com.au, I found it! It was the only such piece out of a couple hundred images! To improve my negotiating image with my dear readers, allow me to inform you it was priced at $375, hanging on a silver chain. On the keft, I present you the 109th mala (prayer bead). then on to the next bead, until one reaches the 109th bead; called a stupa bead. A stupa is a Buddhist prayer hall and its steeple is in the exact shape of the centerpiece of this necklace. The 109th serves a very special purpose: a pause. The pause offers silence, a moment to offer gratitude, and a practical way to keep count of their mantras and chants. Faithful Buddhists don’t just go around the mala once; they can meditate for hours. I was interested to learn the significance of 108 beads: it is a mathematical (12 Zodiac houses x 9 planets) metaphor for the omnipresent universe which is also our most innate self. I would need to meditate for a long time to understand that metaphor! The necklace features turquoise cylinders from Drawer 44 separated by sterling silver beads with a silver clasp. I made a nautilus-style sterling silver loop to attach the mala to the necklace. 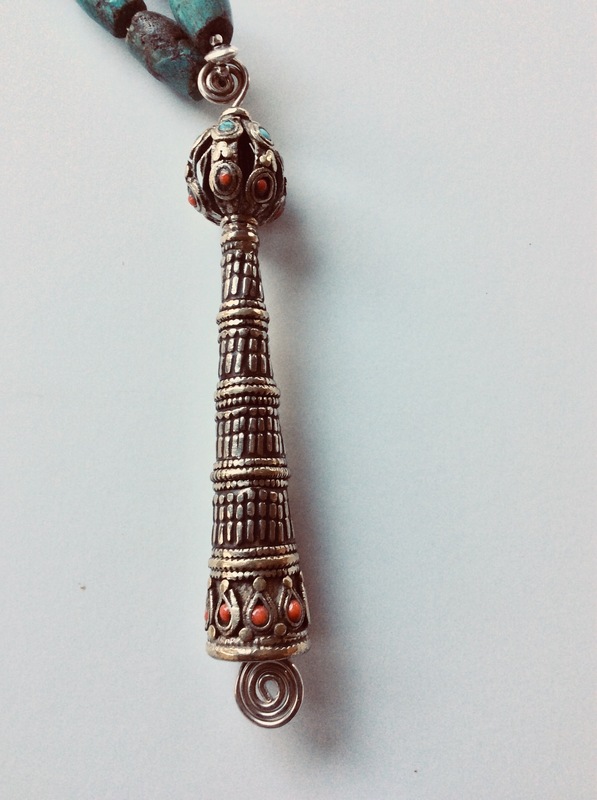 The centerpiece Tibetan stupa bead is mixed metals—silver and brass—rising in a pattern to the pinnacle which is modeled after a Lotus flower with six petals inset with turquoise and coral cabochons. 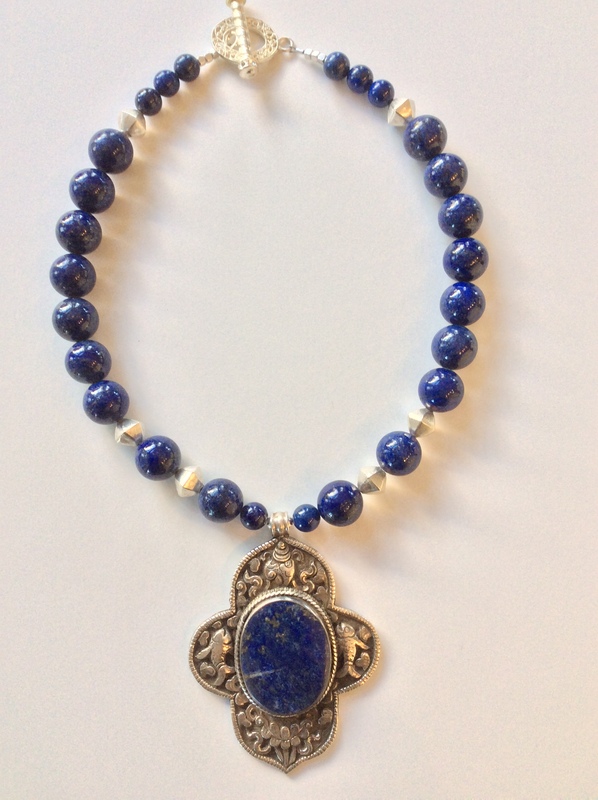 This 109th mala was owned by someone who had the means to commission some very nice design and workmanship. It is strong, sturdy and magnificent! It is not heavy since it is hollow. The necklace measures 25” and the mala is 5” long. Wear your silver earrings with it. $199.